I'm coming off a cupcake "high" since the last ones I made were the ultimate chocolate cupcakes, which were insanely, memorably, delicious! These vanilla cupcakes were able to hold their own and I certainly appreciate how much easier they are to whip up. The basics of this cupcake: the creaming method with butter, sugar, buttermilk, eggs, vanilla, and the dry ingredients. 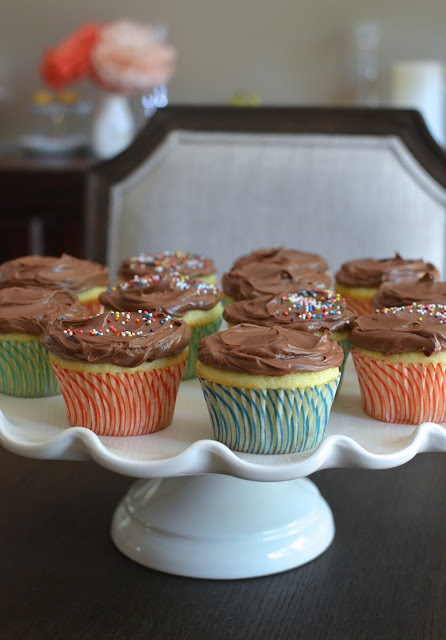 It's fun to break out the colorful cupcake liners for vanilla cupcakes. ...it's dreamy. Butter whipped with some confectioners' sugar, flavored with melted chocolate and a touch of vanilla extract. 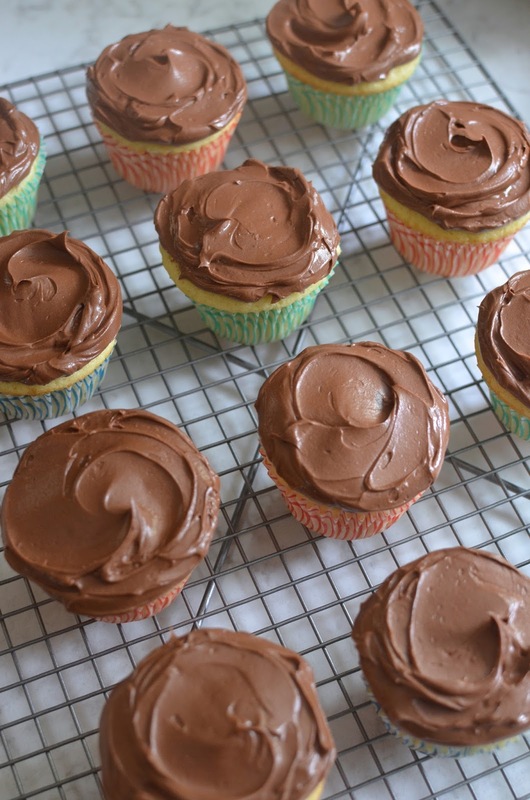 You end up with a very smooth and silky chocolate frosting. I had a lot of fun just placing a big dollop of frosting on top of each cupcake, taking my small offset spatula to it and doing a little spread and swirl. There's something very nice about a rustic frosting applied without piping bag or pastry tip. I could look at these simple cupcakes all day. And because I find it hard to resist the call of the colorful nonpareil sprinkles (you know it's all about the sprinkles! ), I had to shake some over a few. I adore them! Onto a cake stand or placed on a plate, they cupcakes are fun to look at and delicious to eat. It feels like a celebration even when it's no one's birthday and you're eating it on an average Tuesday. Preheat oven to 350 degrees with a rack placed in the center position. Line a standard muffin tin with 12 paper liners. Make cupcakes: In a medium bowl, whisk together the flour, baking powder, baking soda, and salt. Place buttermilk into a measuring cup and add the vanilla extract. In the bowl of a stand mixer fitted with the paddle attachment, beat the butter on medium-high speed until creamy. Add sugar, beat for 2-3 minutes, until light and fluffy. Scrape the bottom and sides of the bowl, as needed. Add eggs, one at a time, beating well after each. With the mixer on low, gradually add half the dry ingredients. Add the buttermilk mixture, then the remaining dry ingredients. Beat until just incorporated. Divide the batter evenly among the 12 muffin cups. Bake for 18-20 minutes, until a cake tester comes out with just a few moist crumbs attached. Let cupcakes cool in the pan for about 5 minutes, then remove them from the pan and onto a wire rack to cool completely. Make frosting: Melt the chocolate chips with the instant espresso powder (if using) in a heatproof bowl set over a pan of simmering water (you can also use the microwave, taking care to do it in increment so as not to overheat and possibly burn the chocolate). Let cool, stirring occasionally, until chocolate is cool but still pourable. Beat butter and confectioners' sugar together in a stand mixer on medium speed until fluffy. Reduce speed to low and gradually add the melted chocolate. Mix until incorporated. Scrape down the bowl, add the vanilla extract, and beat until combined. Finish by frosting the cupcakes with a small offset spatula. Sprinkles makes everything fun for sure. Your boy knows how to live as this frosting sounds amazing. You can tell just by the picture you have one in half this is a light and delicious spongy cupcake. Wishing you a super weekend! They look marvelous with that tender and smooth crumb. You did an excellent job, Monica. That photo of the frosting is one of the yummiest things I've seen in a long time! You've certainly tempted me with those cupcakes. haha! Yes, that creamy frosting was really hard to resist. They look wonderful, your son will love it for his birthday! He did enjoy these a lot and I don't think he'd mind seeing it again next month. Have a great week! I can see why these could be a monthly treat at your house. These cupcakes look perfect! Cupcakes are always a favorite around here and it's been too long since we've made them. Seeing these yummy vanilla ones are definitely making me want to get in the kitchen and bake some up. They look perfect, Monica! Love the chocolate frosting and the pretty sprinkles! I like to read the story that includes every recipe, I think it's nice to add your personal touch to your son's birthday cake. I am cupcakes and frosting person and this great classic vanilla & chocolate is undoubtedly a pure delight. These are wonderful. Time goes faster when you're older and I think with kids, it's even more so. Having a sweet treat is a nice thing on a person's birthday, isn't it?! Love the candles and all the hoopla. I loveee a good vanilla cupcake with chocolate frosting! Something about that classic combo! And if they passed the audition then we know they have to be good! :) Hope you had a great weekend Monica! Wow! 12 years old, time certainly flies doesn't it? these cupcakes look wonderful Monica, love the choc/vanilla combo and of course the sprinkles. Thanks so much, Adina! I know exactly what you mean...I remember having him like it was yesterday. Hope you make a batch soon, thanks! Cupcakes do have a way of just cheering you up and making you happy! I love these - this is my favorite cupcake combo! Simple yet delicious! I love anything with chocolate! So true. Cupcakes and treats put smiles on everyone's faces, I think! Thank you, Tricia. Hope you are relaxing and having a good day! That chocolate frosting looks absolutely perfect! I could just eat several of these right now! Oh Monica, the cupcakes look so perfect...the crumb so delicate...nothing like vanilla cupcakes topped with chocolate frosting...cute with the sprinkles. Thanks for the recipe! Thanks - have a great weekend! Oh wow, Monica! You have your work cut out for you. : ) I'm sure you're a great teacher, and we really appreciate good teachers here! Wish I could send you some cupcakes. Can i bake this as a normal sponge cake? In what size pan?